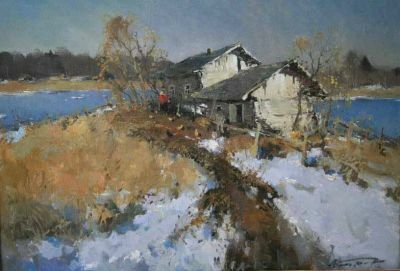 The prestigious I.E. Repin Institute of Painting, Sculpture and Architecture in St. Petersburg, Russia, one of the world’s leading fine arts academies founded by Catherine the Great in 1757, hails Kremer as "an important figure in contemporary Russian realism. He provides a ‘bridge’ from contemporary realism to 19th century European and Russian art. 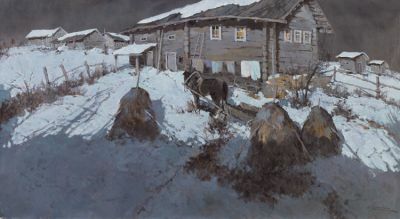 Kremer’s art preserves this rich painting tradition for the next generations of Russian artists." 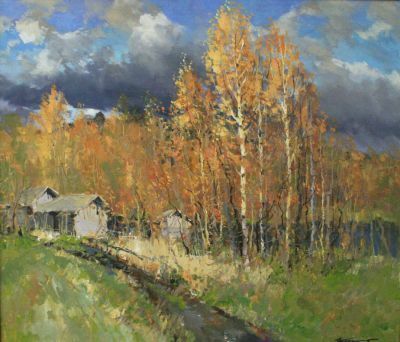 As more contemporary Russian painters veer toward non-traditional styles, Kremer’s embracing of Russia’s artistic past has made him one of the country’s leading and most-collected contemporary painters. 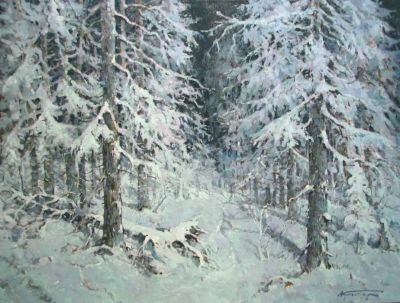 Alexander "Sasha" Markovich Kremer was born on July 21, 1958 in the small Russian town, Repino, on the Gulf of Finland. 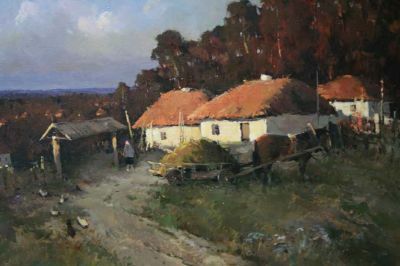 Not surprisingly, Repino was the country home where Russia’s greatest artist, Ilya Repin, completed many of his best-loved paintings. 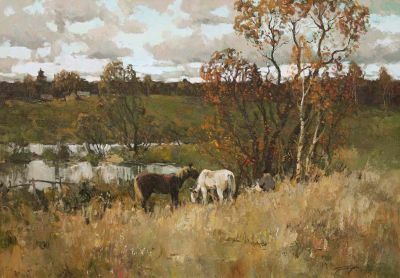 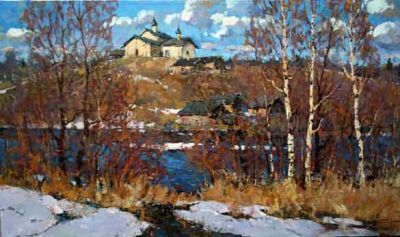 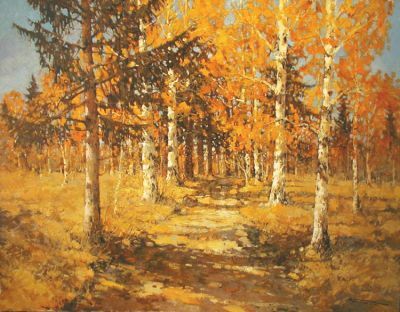 These surroundings have profoundly influenced Kremer, instilling in him at an early age an intense sense of the quiet natural beauty of Russian landscapes and their changing seasons. 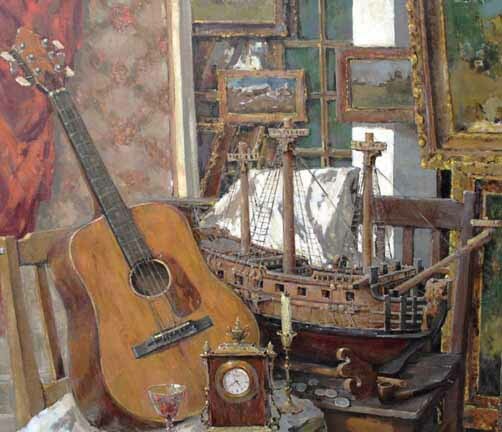 However, he was not just born near great artistic tradition, he was born into it. 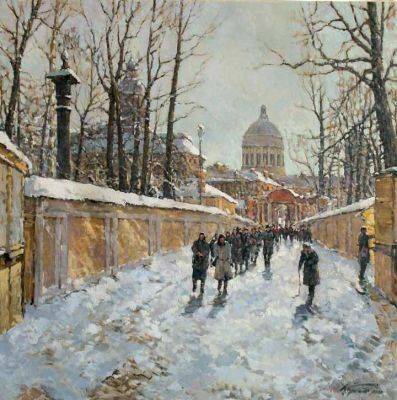 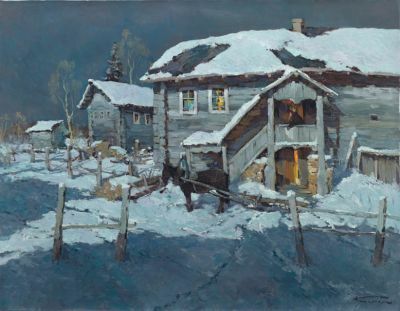 Veniam Veniaminovich Kremer (1899-1978), Alexander’s grandfather, was a fine artist in St. Petersburg whose contemporaries included such Russian masters as Nikolai Fechin, Aleksandr Lyubimov, Petr Buchkin and Isaak Brodsky. His paintings are in the permanent collections of many of Russia’s finest museums. 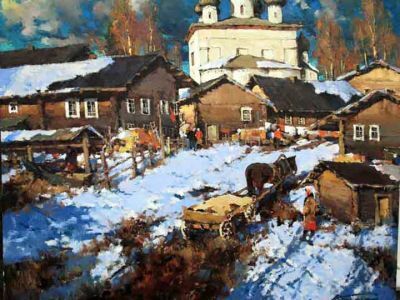 Furthermore, Alexander’s father, Mark Veniaminovich Kremer (b. 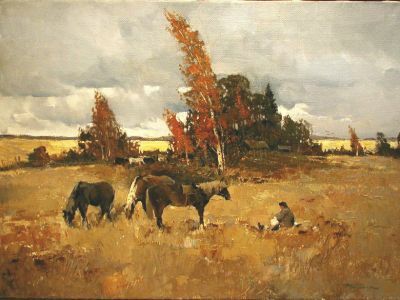 1928), is, also, a well-respected artist in St. Petersburg. 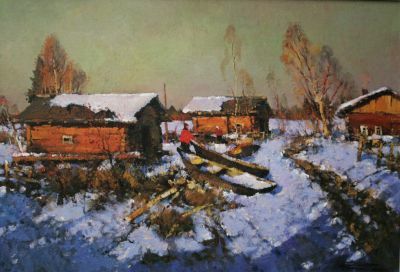 Both men frequently traveled and exhibited abroad on official Soviet State-sponsored trips. 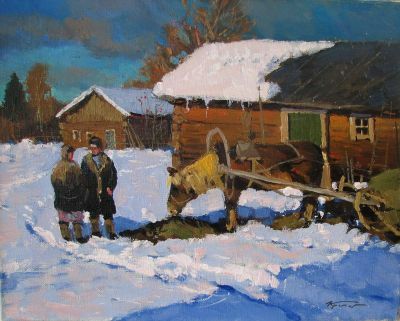 When Alexander was ten, the two elder Kremers began to teach him painting. 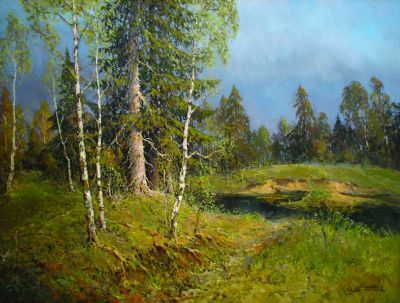 This education in classical 19th century German and Russian painting has built the framework for Kremer’s increasing academic and esthetic mastery of the landscape. 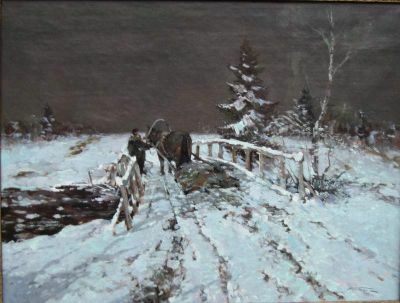 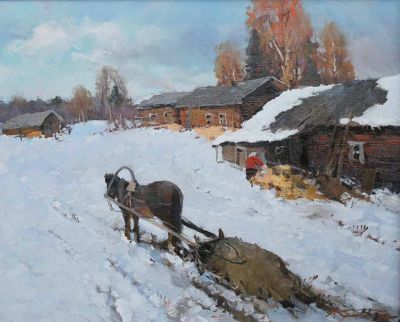 In fact, Kremer paints on the easel of Isaak Brodsky and uses one of Ilya Repin’s palettes, both items left to his grandfather by Brodsky (Repin was Brodsky’s teacher.) 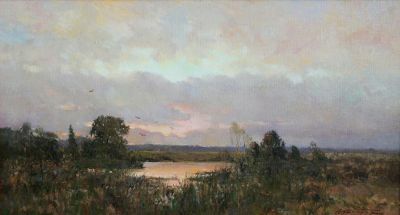 It is clear that Kremer feels a strong connection to the spirit of these great painters. 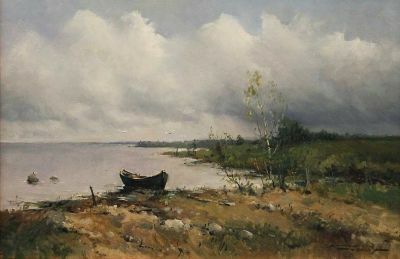 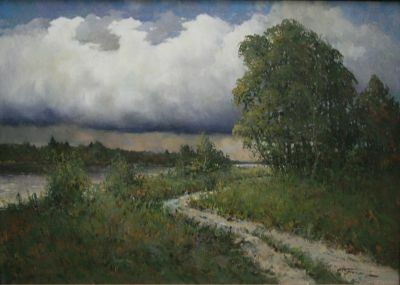 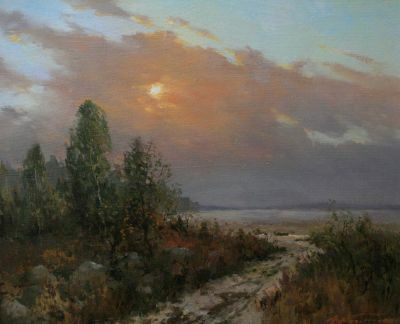 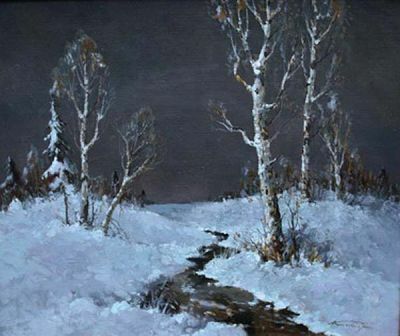 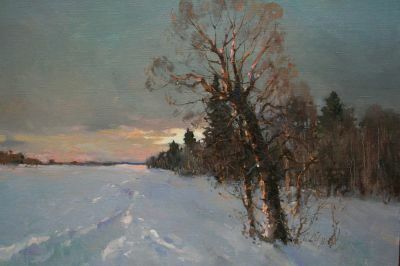 Kremer studied painting from 1977 to 1982 at the Mukhina Art Institute, the second oldest fine arts institution in St. Petersburg founded by Baron Shtiglits in 1879. 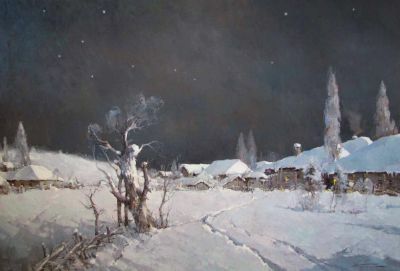 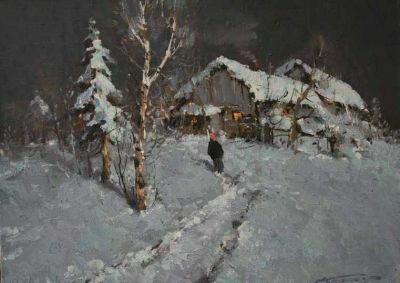 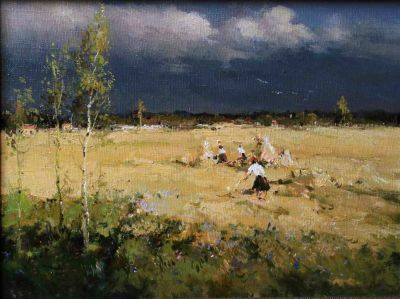 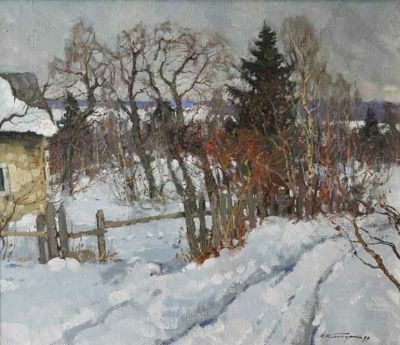 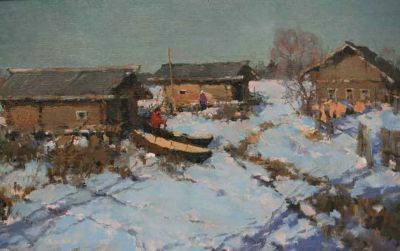 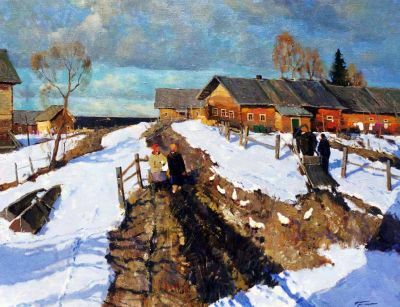 Some of his professors at the Institute included great Soviet painters such as Andrei Yakovlev, Piotr Fomin, Andrei Mylnikov, Anatoli Levitan and Aleksandr Blinkov. 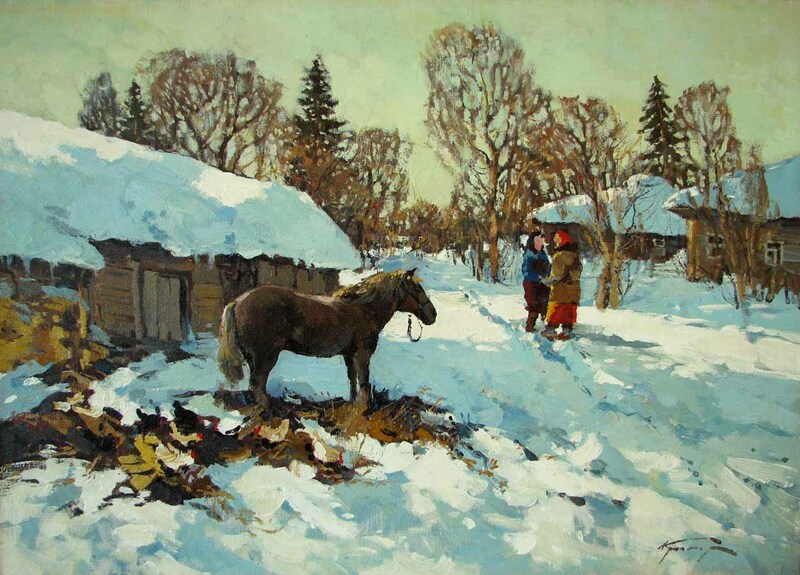 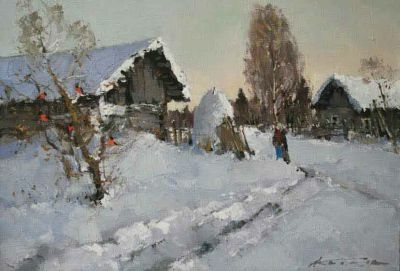 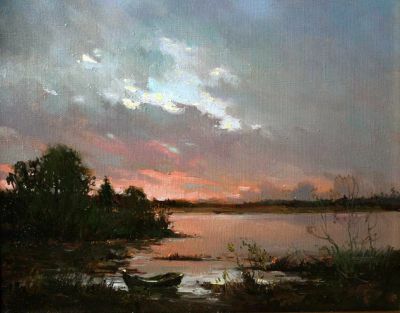 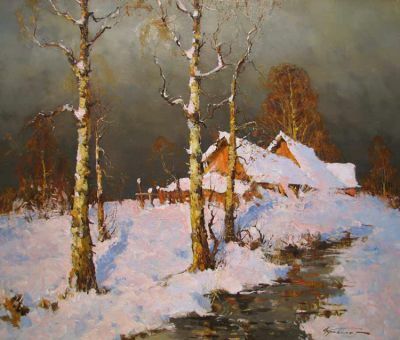 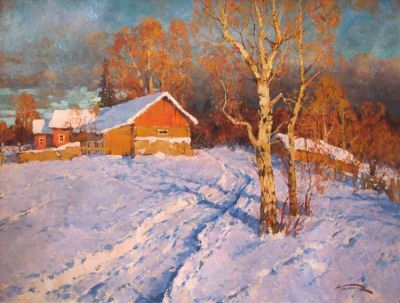 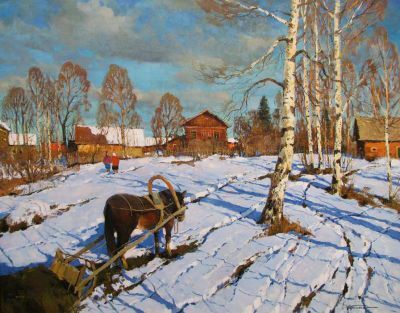 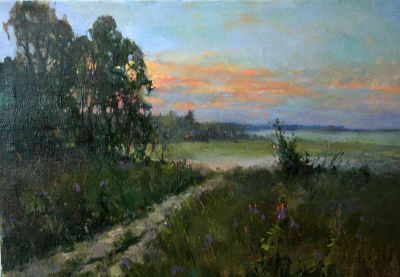 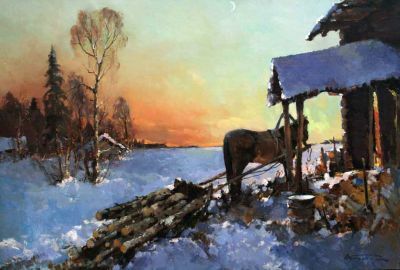 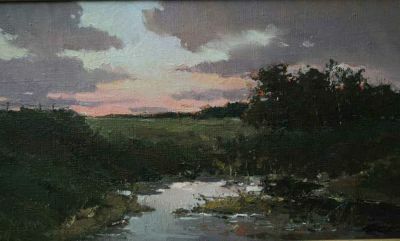 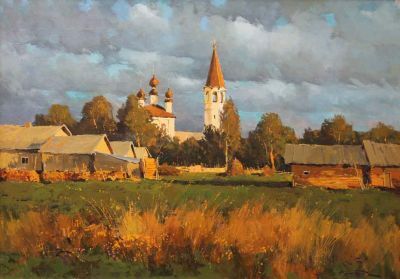 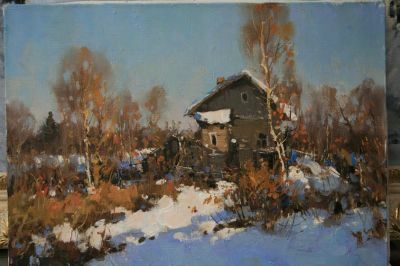 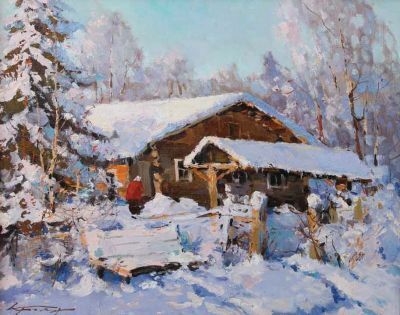 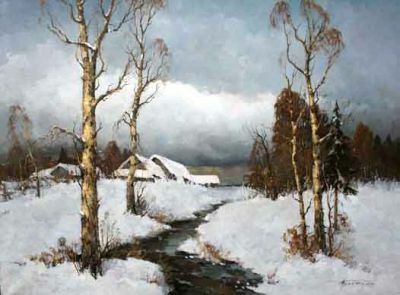 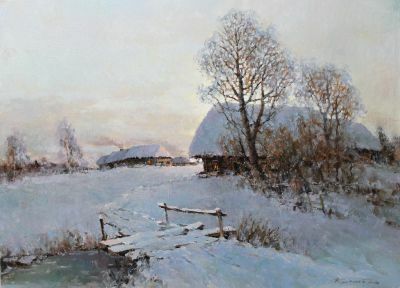 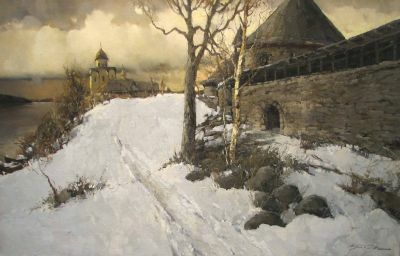 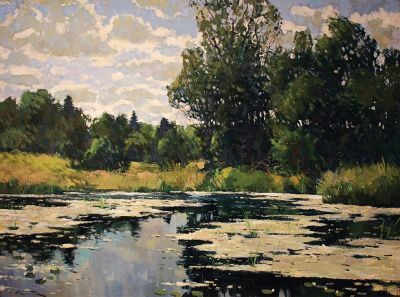 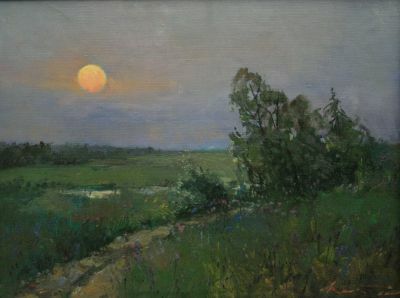 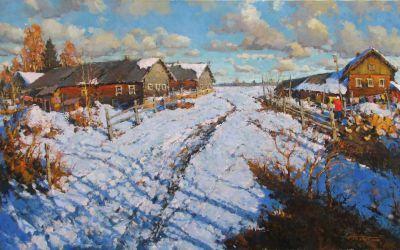 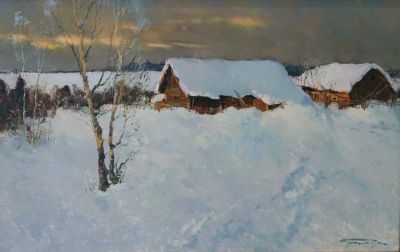 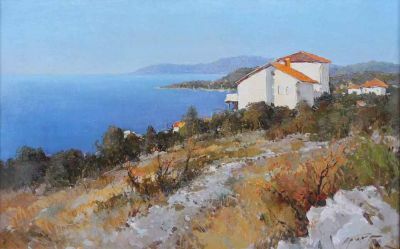 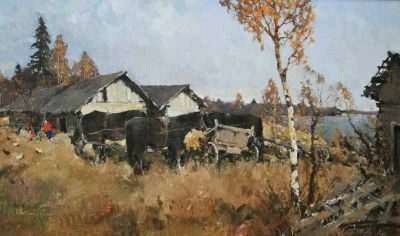 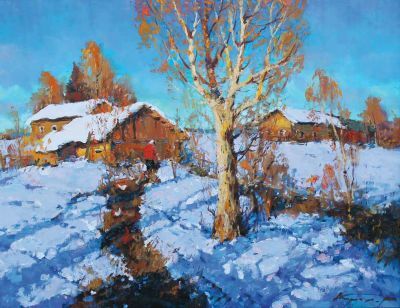 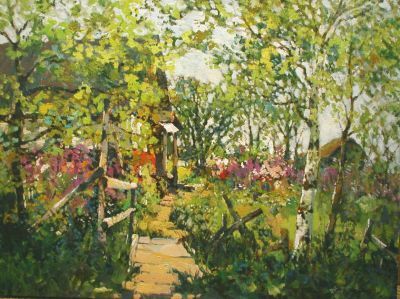 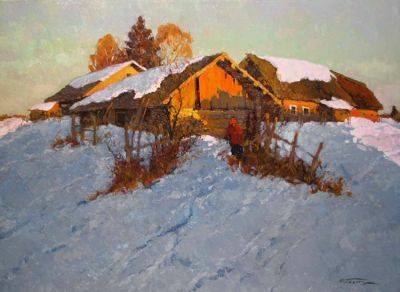 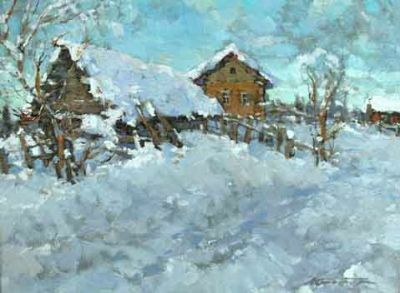 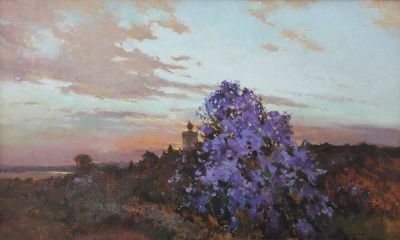 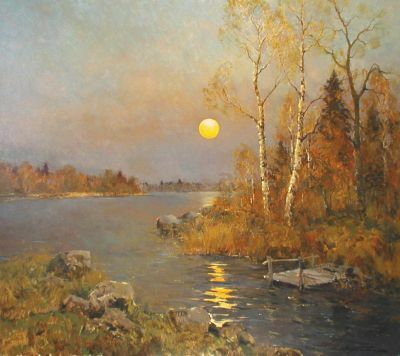 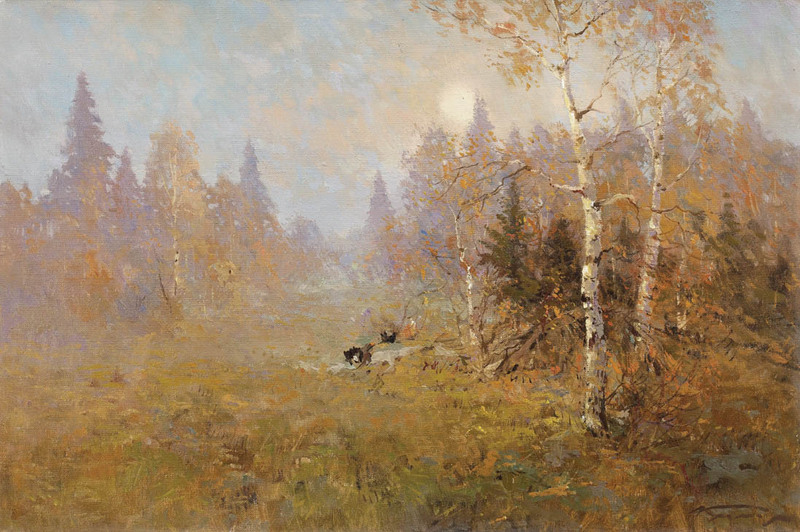 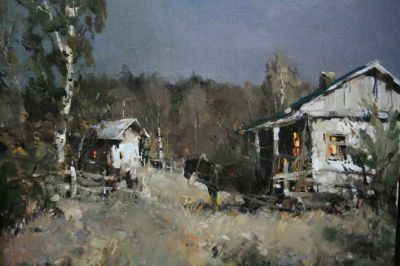 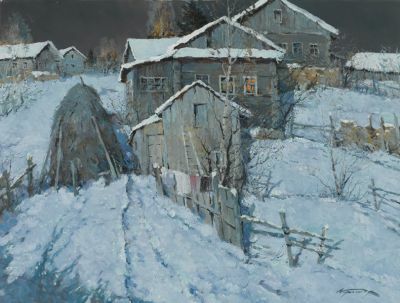 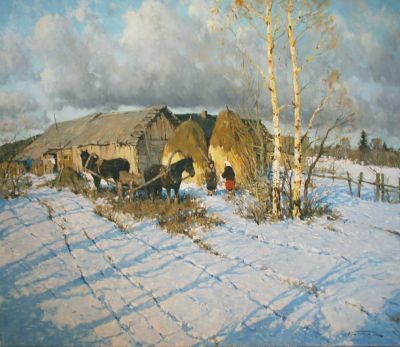 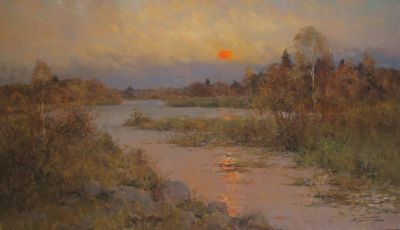 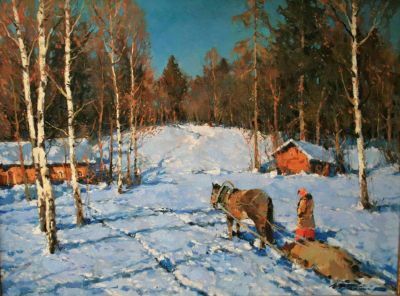 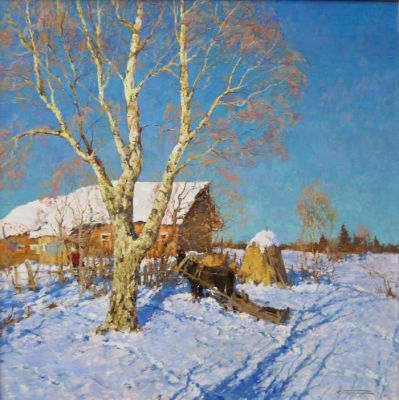 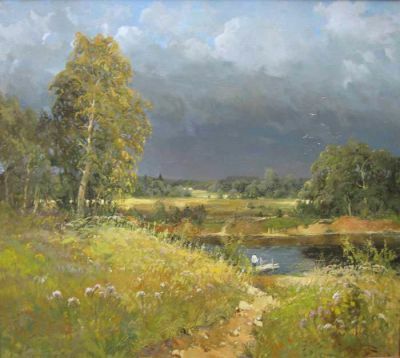 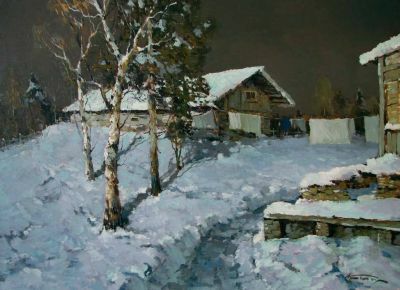 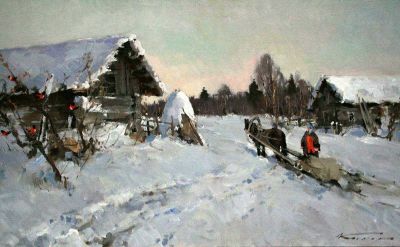 As a professional artist, Kremer is developing a unique position in Russian art with his ability to combine traditional Russian realism with a more contemporary color palette. 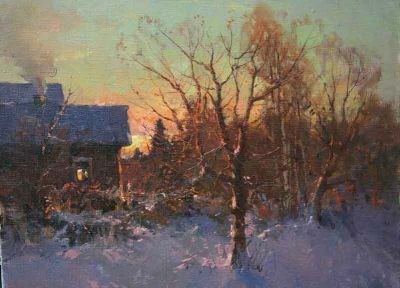 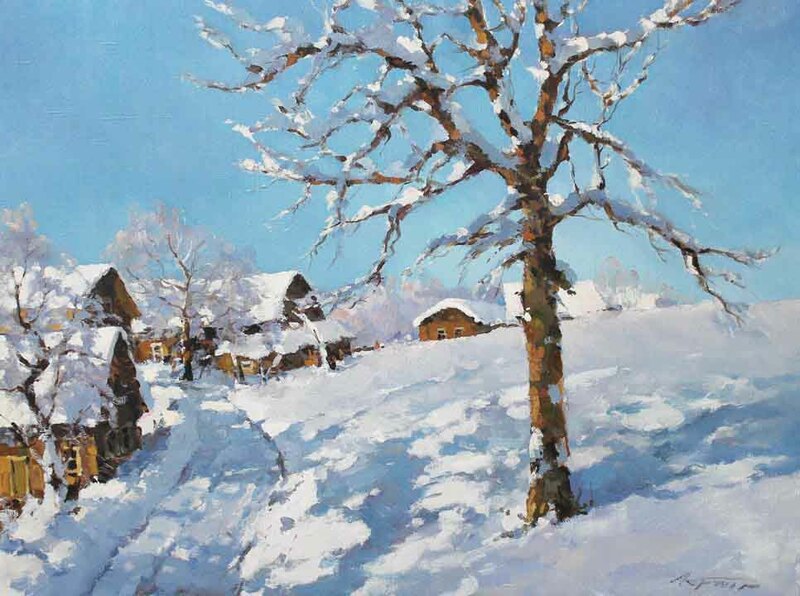 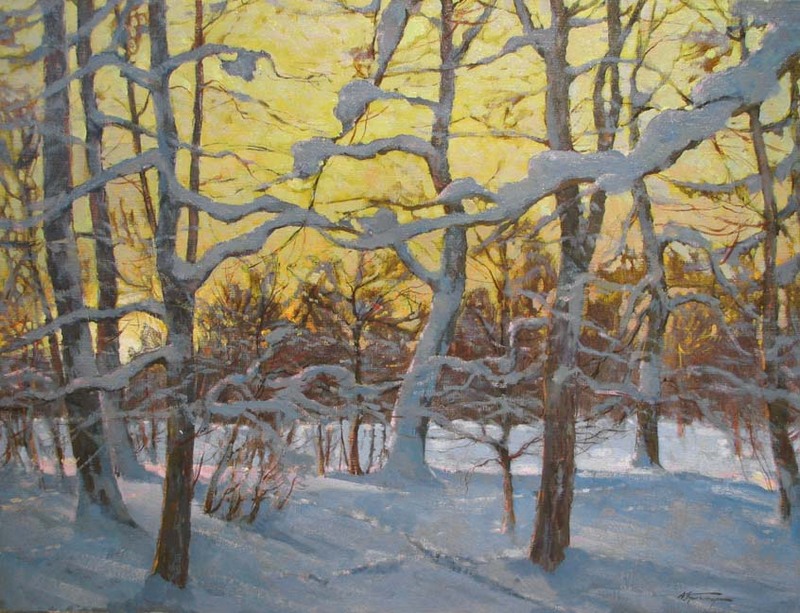 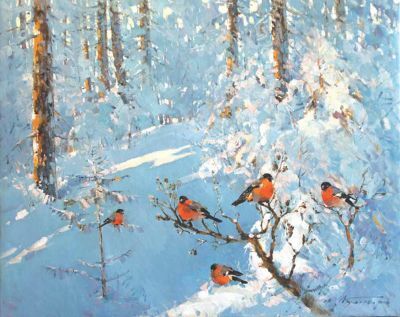 He is already recognized as a master of winter landscapes, and, in particular, of how light and shadow pervade them. 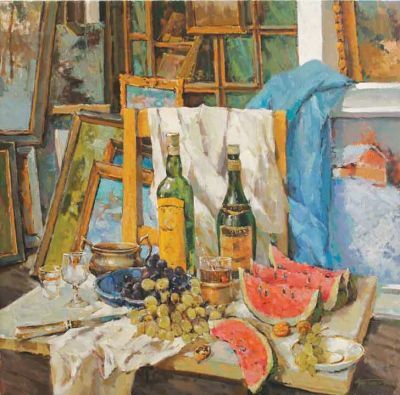 However, Kremer uses these same strong techniques in painting portraits and still lifes. 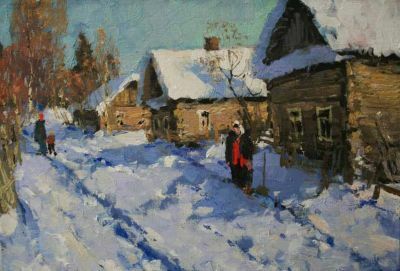 He often paints his daughter, Elena. 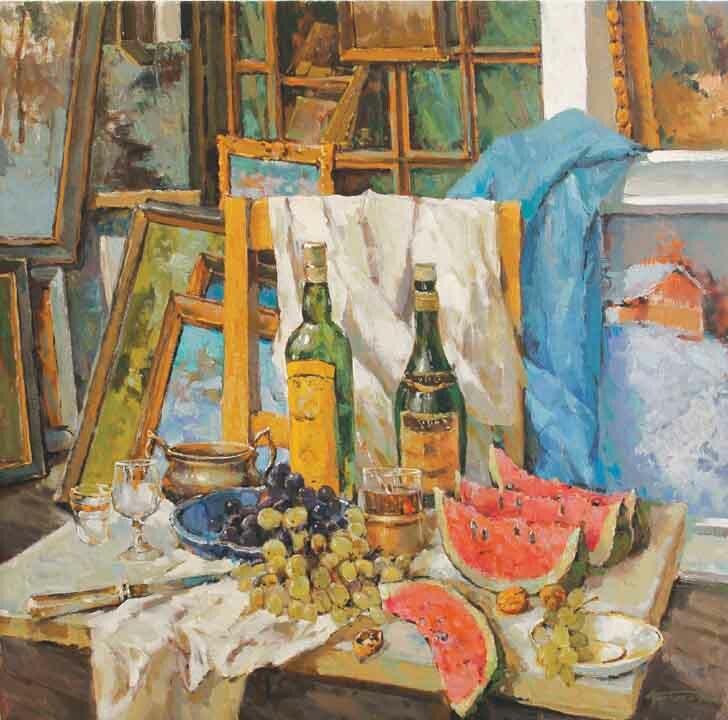 Occasionally, Kremer takes time to explore other artistic mediums. 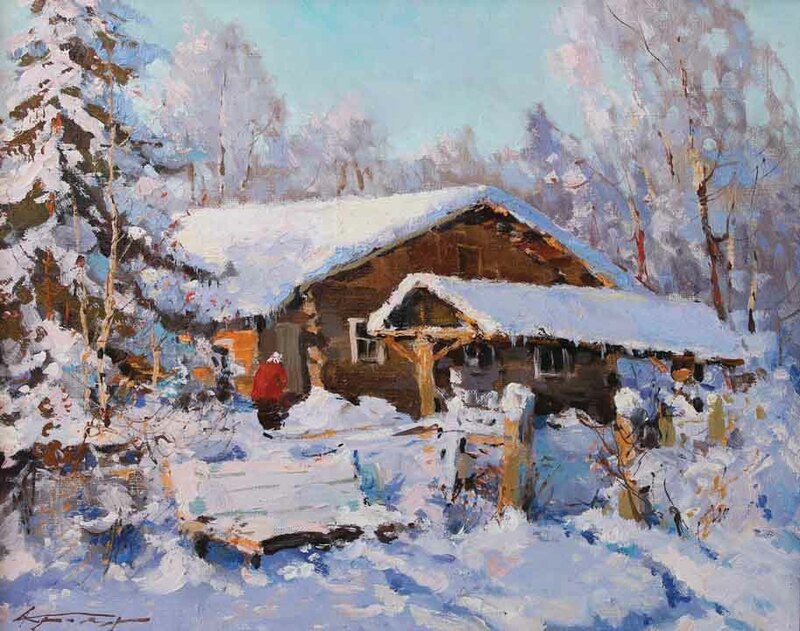 He excels at watercolor, wood carving and jewelry making. 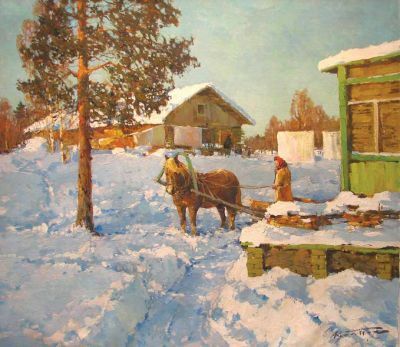 His wife is a master craftswoman whose folk art-decorated wood boxes are in the Folk Art Collection of the Russian State Museum. 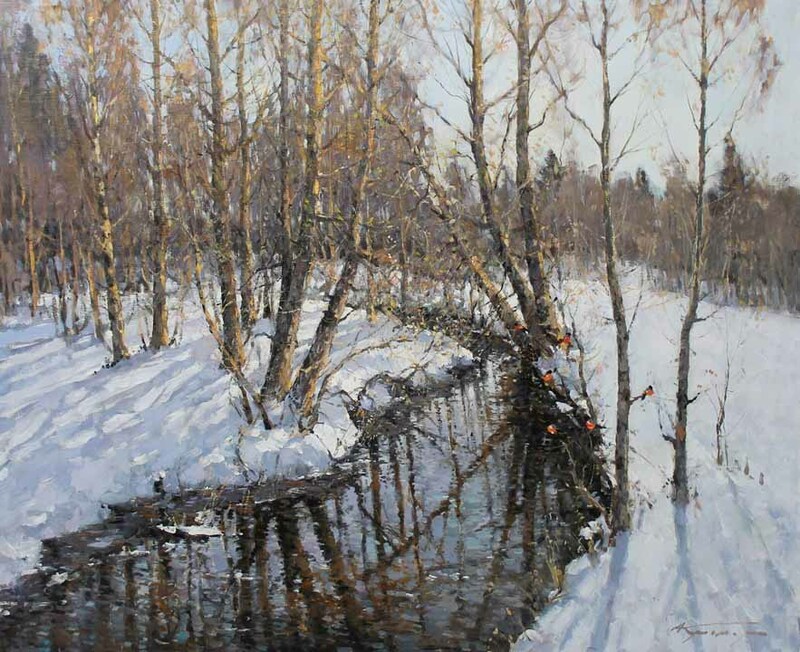 Alexander Kremer started exhibiting in Russia and internationally in 1985. 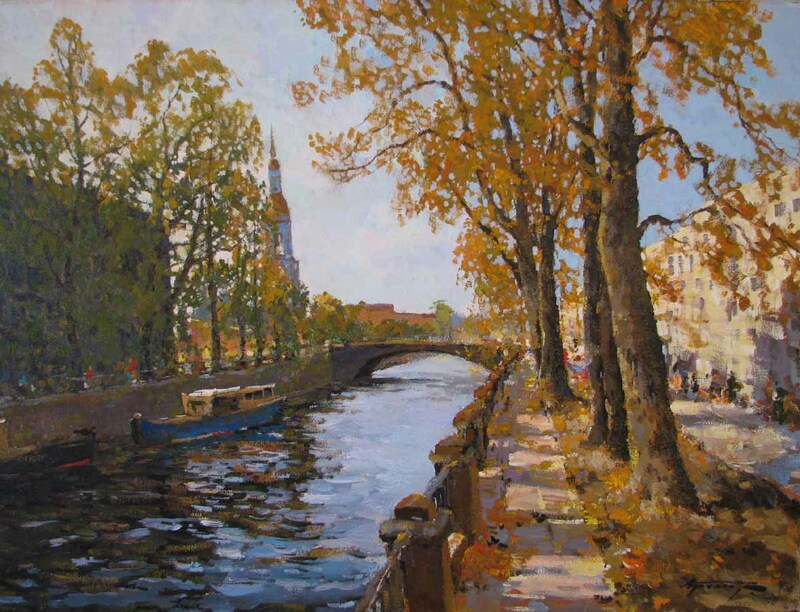 His paintings have been shown regularly in St. Petersburg, Moscow, Helsinki and Germany. Kremer has, also, participated in major exhibitions in Athens, Paris, Tokyo and the United States. 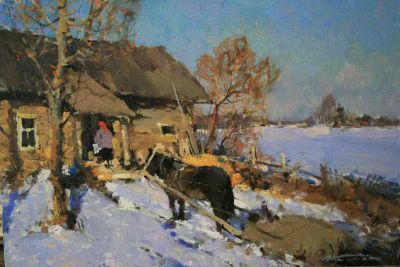 Furthermore, his works are in the permanent collection of the Repin Institute and in many private collections throughout the world. 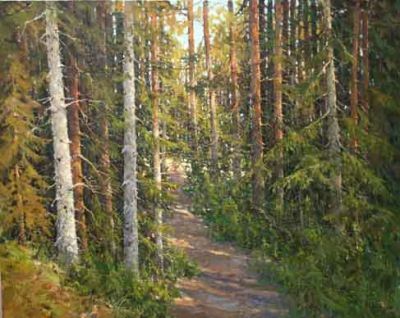 Today, Kremer lives with his wife and daughter, splitting their time between their home in Repino and their apartment/studio in the heart of St. Petersburg.